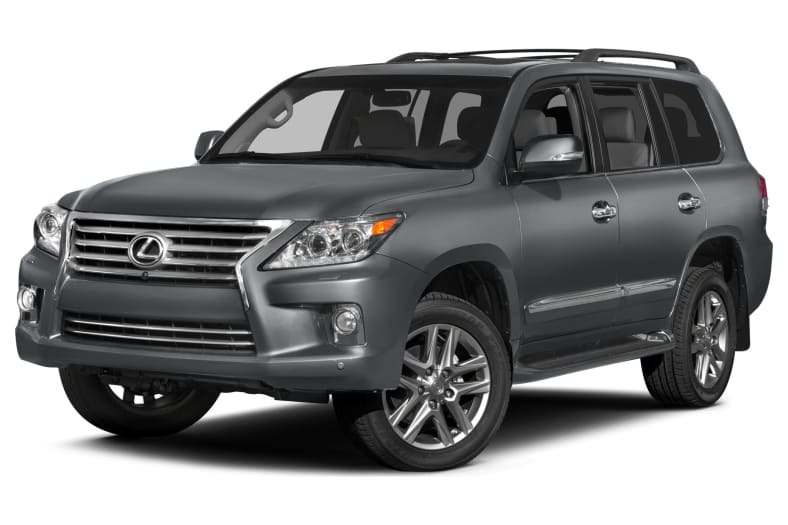 The Lexus LX 570 is a true luxury vehicle, with advanced safety, comfort and quality features. It's also a big, heavy vehicle that can tow hefty loads, haul heavy cargo, and transport up to eight people and their gear across great distances in comfort. The 2014 LX 570 carries over from 2013. The Lexus LX 570 got a new look for 2013, including a new grille, along with updated electronics and additional convenience features. The Lexus LX 570 uses the same heavy-duty frame and stout powertrain as the Toyota Land Cruiser. Like the Land Cruiser, the Lexus LX 570 is designed for extraordinary versatility and an unusual combination of utility and luxury. But with the Lexus, luxury comes first. The Lexus LX offers more technology and a higher level of luxury than what is found on the Land Cruiser. Among its technological advances are wide-view parking monitors, adaptive front headlights, and an active damping suspension control system. A Mark Levinson audio system is also a Lexus exclusive, and the interior is built using a higher level of materials and finish. The Land Cruiser is better equipped for rigorous off-road use; the LX 570, though also highly capable, aims more at the luxury car owner who occasionally needs guaranteed control on a snowy road leading to a ski resort, or safe traction on the graded dirt road leading to a ranch house or mountain fishing lodge. Either vehicle will go just about anywhere. The ability to haul boats or horse trailers up to 7,000 pounds makes the LX 570 the most capable SUV offered by Lexus, while the Land Cruiser can tow up to 8,500 pounds. Safety features are on a par with the best luxury sedans. The Lexus LX 570 is relaxing to drive on long trips, gliding down the open highway with ease; but it's also equipped with a brace of thoughtful features to make around-town driving and parking more convenient. The LX is by now well-established as a technology showcase for Lexus. It was the first Lexus to offer a wide-view front and side monitor system for hard-to-see areas. Cameras are located inside the grille and below the right-hand side-view mirror, and the radar antenna is positioned behind the Lexus emblem in the front grille. The LX also offers Adaptive Radar Cruise Control and a Pre-Collision System. A tri-lingual navigation system first appeared in 2008. The latest hard-disc system incorporates Bluetooth, Lexus Enform with Safety Connect, Lexus Insider, music streaming, and of course the usual XM NavTraffic, NavWeather, Stocks and Sports. Also included are automatic phonebook download capability, fuel prices, and the Lexus Enform Application Suite. Smart Access keyless entry unlocks all five doors when the driver touches a door or tailgate. So long as the key fob is somewhere on your person, Bluetooth proximity sensors unlock the car automatically.